Although a considerable number of cancer patients suffer from emotional distress which may have an impact on their quality of life, it still remains poorly understood which psychosocial factors contribute to individual vulnerabilities to emotional distress of cancer patients. Recently, resilience has been suggested as the capacity to cope with adversities like cancer. In this study, we investigated the relationships between resilience and emotional distress in cancer patients. One hundred fifty-two cancer patients who were consecutively hospitalized for their scheduled treatments at the Seoul St. Mary’s Hospital were enrolled and completed the Connor–Davidson Resilience Scale and Hospital Anxiety Depression Scale to measure resilience and emotional distress. The relationships between the levels of psychological resilience and emotional distress were evaluated using univariate and multivariate logistic regression analyses. Psychological resilience levels were negatively associated with emotional distress after controlling for relevant covariates. The highest quartile of resilience level was associated with a 90 % (adjusted odds ratio [OR] = 0.10, 95 % confidence interval [CI] = 0.03–0.34, P < 0.001) reduction in the risk for emotional distress compared to the lowest quartile. Among metastatic cancer patients, resilience was also found to be a significant protective factor for emotional distress (adjusted OR = 0.14, 95 % CI = 0.02–0.79, P = 0.02). The present study suggests that psychological resilience may independently contribute to low emotional distress in cancer patients. The relationship between resilience and emotional distress was also significant in the subgroup of metastatic cancer patients. 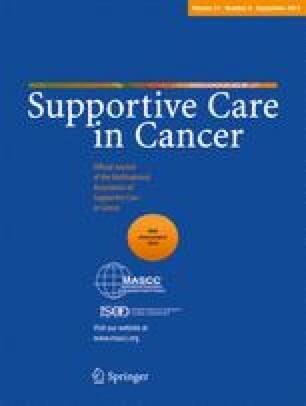 Psychosocial interventions to enhance resilience might provide useful approaches to overcome cancer-related emotional distress. This research was supported by Basic Science Research Program through the National Research Foundation of Korea (NRF) funded by the Ministry of Education, Science and Technology (2010-0003505), by the Cancer Research Fund of the Catholic Comprehensive Cancer Institute in 2008, and by the Dr. Dae-Kyoon Bae Memorial fund from the Korean Neuropsychiatric Association Research Foundation in 2009. The authors do not have a financial relationship with the organization that sponsored the research. The principal author (T.-S. Kim) has full control of all primary data, and the authors agree that Supportive Care in Cancer can review these data if requested.